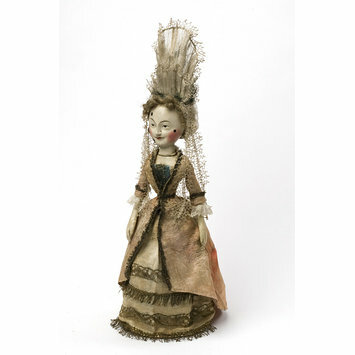 The Old Pretender is one of the oldest dolls in the museum's collection. It was carved from wood and covered with gesso (a mixture of plaster and glue) before being painted. The doll is fashionably dressed with a wig made of human hair and beauty spots painted on the face. It is associated with the court of King James VII (of Scotland) and II (of England and Wales) at the palace of Holyroodhouse in Edinburgh. It is said to have been given to a family of loyal supporters by James II's son James Edward (acknowledged James VII in Scotland but not James III in England and Wales who was subsequently known as 'The Old Pretender'). 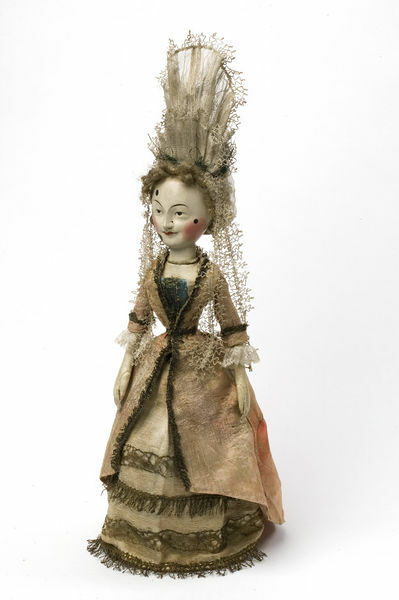 A female fashion doll known as 'The Old Pretender doll' from her history. The doll represents a caucasian adult female: her head and body are carved out of separate pieces of wood and are gessoed and painted; her hands are covered in kid leather. Her face is adorned with black beauty spots which were at the height of fashion when she was made. She wears a fontange head-dress with lappets, and a coral-coloured satin dress (now faded) over a blue stomacher and a skirt trimmed with metallic lace and fringe; her legs are covered with linen to represent stockings, and her feet are encased in fabric shoes. Associated with the court of King James VII and II at Holyroodhouse in Edinburgh, and said to have been given to a family of loyal supporters by James II's son James Edward (acknowledged James VII in Scotland but not James III in England and Wales, and subsequently known as 'The Old Pretender'). Extract from Clare Style's letter of 30/03/1956: ...Major Vivian Nickalls, my brother, placed with you, on my behalf, a Stuart doll seated in a chair. You labelled it as "Queen Anne" [this was a term at that time applied erroneously to early wooden dolls of almost any date], and [I] believe it is still so described. I therefore thought the following notes might interest you, culled from old family notes and papers. Those re the doll were testified to by a Miss Margaret Bray, daughter of one Admiral E. Bray (my great-great-Aunt) - I am 78. About 1800 her great friend was a Miss Elizabeth Cunningham, daughter of Captain James Cunningham, R.N. Her mother's family were close adherents of the [Young] Pretender, Charles Stuart, and had accompanied them to St Germains (one being a lady-in-waiting). Thus Miss Cunningham had been given many gifts of great interest, among them being "A large old Doll, which had been in use at Holyrood, and a chair for the said old Doll, an exact pattern of those in use in the Palace." Miss Cunningham left all to Miss Bray when she died..."